If you're putting long hours into your yard every week with little to show for it maybe its time to call Elkhart Landscape. Check with us for our sod installation cost per square foot. You're sure to be happy with the price and even happier with the way your lawn looks after an Elkhart Landscape crew has laid thick healthy sod topped with beautiful luscious green grass on your property. There won't be anymore desperate struggles with weeds, bare spots and poor topsoil. When Elkhart Landscape finishes a sod installation on your property it will be instantly transformed into a jewel in your Elkhart, Indiana neighborhood. You're likely to be surprised at how low sod installation costs can be. When you have Elkhart Landscape transform your yard into a perfect lawn in just a few hours you'll be astounded. Just think, not only of the money that you save, but, the time as well. Now the only thing you'll need to do with your lawn is to keep up with the mowing; because all that other extra effort you were putting into getting healthy grass to grow on your poor soil is over. An Elkhart Landscape sod installation can be thanked for that. The best part is you know you won't just get good work, you'll get it at the best possible sod prices around. If you ask Elkhart Landscape to lay your sod for you, you know we're going to do the a great job. We realize, however, that some people want to save as much money as possible. 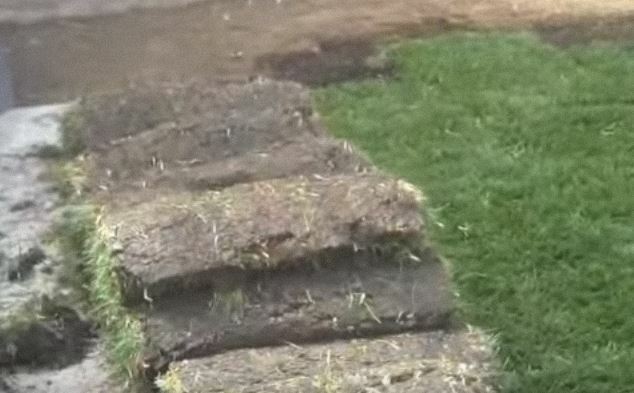 So, if you decide to consult a sod installation guide and do the work yourself we won't hold it against you. In fact, we'll go so far as to give you any special sod installation tips you might need. After all, no two lawns are the same and no written manual can be guaranteed to deal with each challenge yours might present. Now, you may ask, why does Elkhart Landscape take this attitude? The reasons really are twofold. First, that's just the kind of people we are. That is to say nice people who like to help others out. Our talent happens to lie in the area of making the exterior of homes beautiful. It's what we love doing and anything we can do (for pay or not) in that area is gratifying to them. The second reason comes more from a business person's perspective; but, we think, and no doubt you'll agree, still pretty reasonable. Yes, Elkhart Landscape does hope to get something from our willingness to help you out with free advice from time to time. Here's what it is, we hope to get your business for projects that you might not be ready to tackle on your own. If that just isn't going to happen for awhile they hope you'll at least say good things about us to your friends, neighbors and relatives. Remember though the real smart choice is for Elkhart Landscape to install your sod. Contact us today. ​Your home is one of the biggest, if not the biggest, financial investments you will ever make. Taking care of that home, inside and out, is important to maintain not only the aesthetic appearance of where you live, but to maintain the value as well. Landscaping the outside of your home brings a great first impression to your guests, plus added overall value. Elkhart Landscaping is a professional landscaping company located in Elkhart County and has been in business for many years. They service not only the Elkhart area but all surrounding cities and townships in the Michiana area, both residential and commercial. If you need help with trimming trees and shrubs, seasonal flower planting and care, rock removal, sod installation tips, or the advice of a landscape architect to create a whole new look, you will find all these services and more. Elkhart Landscaping utilizes only professional equipment and staff. You can rest assured that the person you entrust with your home will have the correct equipment and know exactly how to use it. Experience is important in any large undertaking, including landscaping. The professionals at Elkhart Landscaping have the experience to make your dreams a reality, as well as answer any questions that may arise. For example, if you are looking for sod prices, they will be happy to provide you with a sod installation guide, sod installation cost (including sod installation cost per square foot), and any other information you will need regarding the process. Elkhart Landscaping is not only professional and reliable, but affordable. in these economic times, finding a good value is important for all goods and services you purchase, and landscaping is no exception. Contact them with your project ideas, and they will beat any advertised price!